Central NE Community Action Partnership offers Head Start/Preschool services for area 3 and 4-year old students in the Schuyler Early Learning Center during the school year. Children attend Monday through Thursday in the morning or afternoon session. Healthy meals and snacks are provided, along with a nurturing and caring learning environment. The Early Head Start Child Development Center is a quality, comprehensive child development program serving children 6 weeks to 3 years old. All diapers, wipes, baby-food and formula needed during the day are provided free of charge. 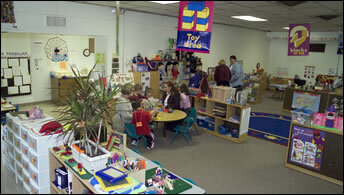 The Child Development Center is open Monday-Thursday from 7:30-5:00. The Sixpence and Early Head Start Home Based program offers weekly home visits to support parents in educating and nurturing their child, serving prenatal mothers and children up to 3 years old. Prenatal education and planning are offered for expectant mothers along with periodic nurse visits. Home visits include infant health checks for babies, parenting skills support, and learning activities for infants and toddlers.